Recommended Retail Price: £125 from Mammut. The Trion Guide 35+ is a robust, cleverly featured alpine day pack. It is aimed at winter climbers and ski-mountaineers who want a pack that easily absorbs a full day’s equipment, carries well and lasts. With its ability to expand an extra 7 litres it can just accommodate the necessary equipment for a lightweight multi-day hut tour. I was in dire need of a new “do everything” pack that I could use ice climbing, winter mixed and alpine climbing and ski touring. 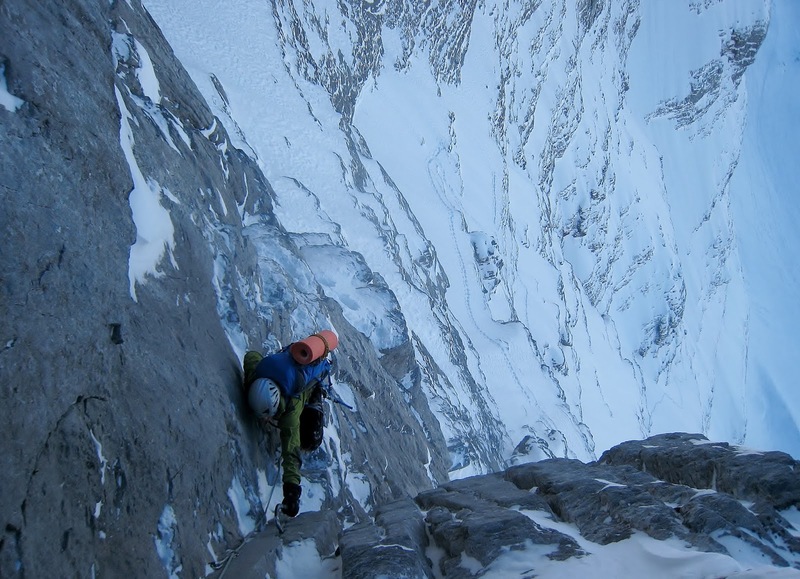 As such, I needed it to be able to securely carry a pair of modern curved ice axes (Petzl Nomics), wide skis, typical winter climbing equipment and, on occasion, a pair of size 46 alpine winter boots (Spantiks). I quickly discounted the Gregory Alpinismo as I did not like the ice-axe attachments or the lack of dedicated, toughened ski carry straps. The Black Diamond Alias was in the running – I liked the “hidden” ice-axe carry points and the generally sleekness of the pack, but I felt that the lid pocket would not be very accommodating when the pack was stuffed to the brim. 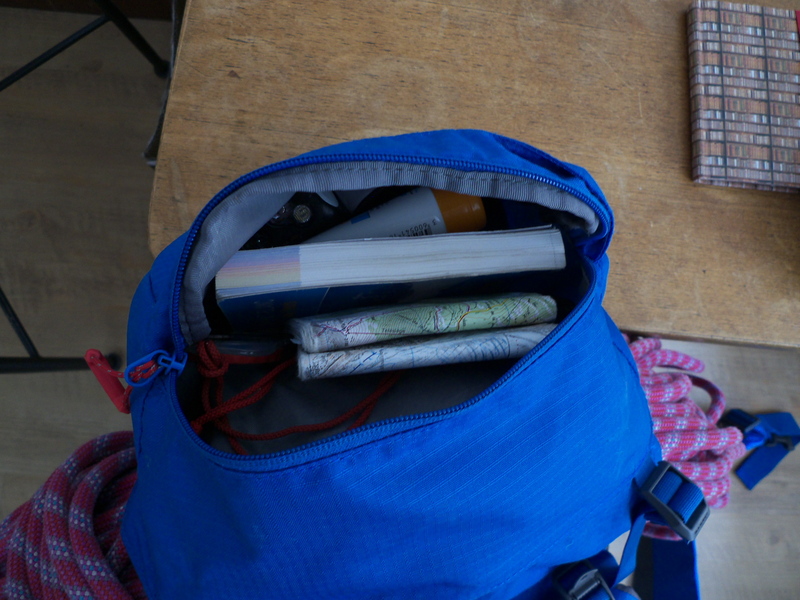 From the two remaining packs I had pretty much settled on the Deuter Guide Lite 32+. It is voluminous enough to fit my usual amount of gear, it’s light at 1200 gr., has secure ski and axe attachments and is surprisingly good value at SRP £85/€95. In the shop I loaded both the Deuter and Mammut up with 12kg of weights, adjusted them and spent five minutes going up and down the stairs, lurching around to test the stability and comfort. It was at this point that, for me, the Mammut won hands-down. It felt much more stable and the shape of the back panel fitted me very well. 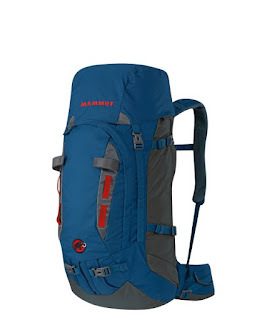 I have been very impressed with this pack’s ability to absorb all my climbing gear. Around Chamonix in winter the best way to approach many routes is to ski down from the top lift to the base of the route, climb, abseil, ski down to the pub. 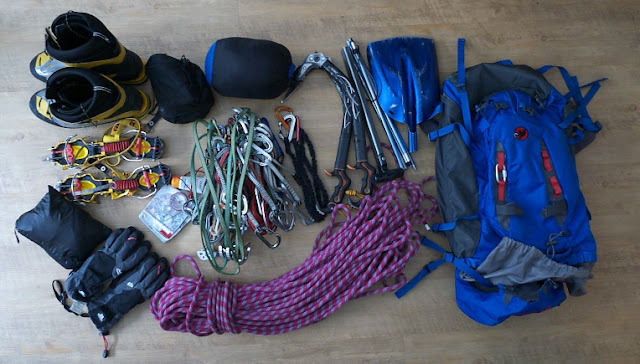 I don’t currently have “approach” skis and my ski boots are not warm enough for climbing in, so I generally carry my alpine boots in my pack along with: axes, crampons, rope, half a rack, down jacket, avalanche kit, food, spare gloves. When climbing you can remove the waist strap saving weight and allowing good access to you gear loops. The pack is supplied with a thin webbing waist belt which adds a bit of stability when you have the main waist strap removed. When loaded up with a stove, bivvy gear etc. the pack remains stable and carries comfortably. This bag has many useful features to make carrying and attaching gear more secure, more functional and more accessible. Firstly, the main compartment closure has a single top compression strap above which there is a rope-attachment strap which allows the innards of the pack to be compressed giving a more stable platform for the rope to sit on. Secondly, the rope attachment is “floating” which allows access to the main compartment without having to detach the rope. Very handy. There is also a pair of webbing accessory loops on the front of the pack that can be used to attach extra equipment, such as a camping mat. Love them or hate them, pack lids are often a source of frustration. For me, it is very important that when the pack is stuffed full, the lid pocket is still accessible and usable. It was an issue I had with my old Deuter Guide 45+ and it was one of the reasons I didn’t buy the Black Diamond Alias 35. The lid on the Mammut is very nearly perfect. When the pack is full, the pocket is easily accessible and none of the volume is taken up by the pack – the lid very much “sits” on top of the pack and is very stable – it rarely slops about like many other lids. The zipper has a nice big pull cord. There is also a mesh pocket underneath with a key attachment. My only gripe is when the pack is very full, the lid closure straps can be a little on the short side. 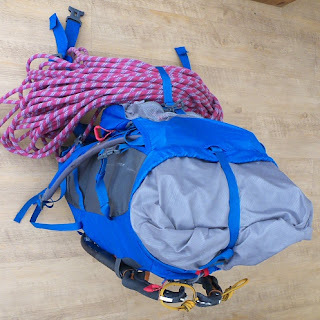 When not climbing, I’ve ended up using this pack a lot for ski-touring and even just glacier skiing when I need to carry an axe and crampons – my smaller ski bag doesn’t have an ice-axe attachment. While it is bigger than I would want for a “day” touring pack it is very comfortable and stable even with the hip-belt removed and can be cinched down tight using the side compression straps. It is very quick and easy to put the skis on and they stay solid and secure. The ski carry straps are spacious enough for modern (100mm +) skis. When touring I often use the front crampon pocket to stash my avalanche shovel and probe. Very large or long shovels might not fit. The buckles iced up once, making it difficult to open the pack. A quick blow of warm air melted them but it was a bit annoying. When very full, the main compartment compression strap and lid closure straps are about 5cm too short. You just need to remember not to completely over-stuff the main compartment. The ice-axe attachment loops, while very secure, can be a bit of a fiddle with Nomics – especially when the pack is full. Some of the seams are starting to pull out a little around the attachment point. A small tear appeared on the inside of the shoulder strap within a few uses. It’s not in a load-bearing area, but a bit of shame that it appeared so quickly. I feel that it strikes a good balance of functionality (without being overly featured), toughness and weight. There are lighter and more streamlined packs available if you don’t envisage carrying skis, but if you do this pack should be on your list.